Salicylates have long been known as water soluble compounds derived from a number of plants, particularly Willow and Meadowsweet with analgesic, antipyretic and anti-inflammatory properties, and comprises the main ingredient in aspirin. Free salicylic acid and trace quantities of related phenolic glycosides are widely distributed among many foods, particularly fruits. Due to the minute concentrations involved these plants are considered unimportant as medicinal herbal sources of salicylates and are not listed here. Some authorities consider the ingestion of these foods to be associated with various conditions, notably Attention Deficit issues in children. Neem is the newest ‘craze’ in natural healing ingredients. Neem proponents state that it can cure some 40 different diseases. What you need to know is that Neem contains compounds similar to those in aspirin and should not be used to treat children with fevers, or taken by people with known allergies to aspirin and aspirin like substances. 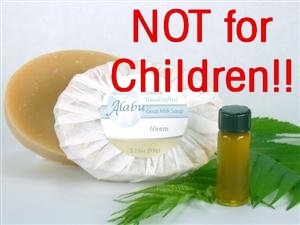 Neem should not be taken by anyone who is pregnant or trying to conceive. Neem oil should not be taken internally. So, please, learn all you can about that herbal ingredient before you use it, especially with a child; it could just save your life, or the life of a loved one!